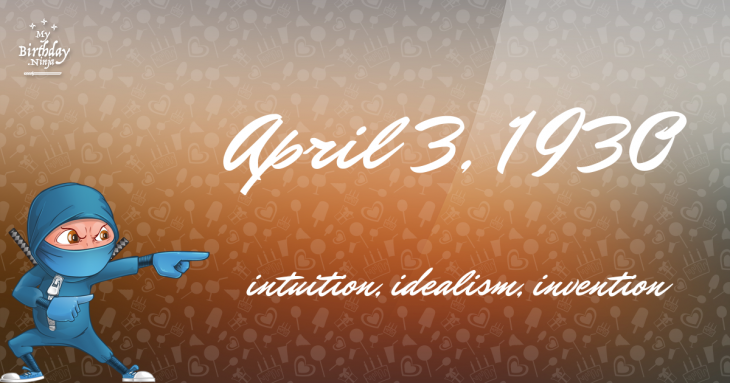 Here are some snazzy birthday facts about 3rd of April 1930 that no one tells you about. Don’t wait a minute longer and jump in using the content links below. Average read time of 9 minutes. Enjoy! What day was my birthday Apr 3, 1930? April 3, 1930 was a Thursday and it was the 93rd day of the year 1930. It was the 14th Thursday of that year. The next time you can reuse your old 1930 calendar will be in 2025. Both calendars will be exactly the same! This is assuming you are not interested in the dates for Easter and other irregular holidays that are based on a lunisolar calendar. There are 347 days left before your next birthday. You will be 90 years old when that day comes. There have been 32,526 days from the day you were born up to today. If you’ve been sleeping 8 hours daily since birth, then you have slept a total of 10,842 days or 29.68 years. You spent 33% of your life sleeping. Since night and day always follow each other, there were precisely 1,102 full moons after you were born up to this day. How many of them did you see? The next full moon that you can see will be on May 18 at 21:13:00 GMT – Saturday. Fun stat: Your first one billion seconds (1,000,000,000) happened sometime on December 10, 1961. If a dog named Chippie - a Lowchen breed, was born on the same date as you then it will be 376 dog years old today. A dog’s first human year is equal to 15 dog years. Dogs age differently depending on breed and size. When you reach the age of 6 Chippie will be 40 dog years old. From that point forward a small-sized dog like Chippie will age 4 dog years for every human year. United States President Harry S. Truman signs the Marshall Plan, authorizing $5 billion in aid for 16 countries. Hudsonville–Standale tornado: The western half of the Lower Peninsula of Michigan is struck by a deadly F5 tornado. United States v. Microsoft Corp.: Microsoft is ruled to have violated United States antitrust law by keeping “an oppressive thumb” on its competitors. Islamic terrorists involved in the 2004 Madrid train bombings are trapped by the police in their apartment and kill themselves. ATA Airlines, once one of the ten largest U.S. passenger airlines and largest charter airline, files for bankruptcy for the second time in five years and ceases all operations. What does my birthday April 3, 1930 mean? 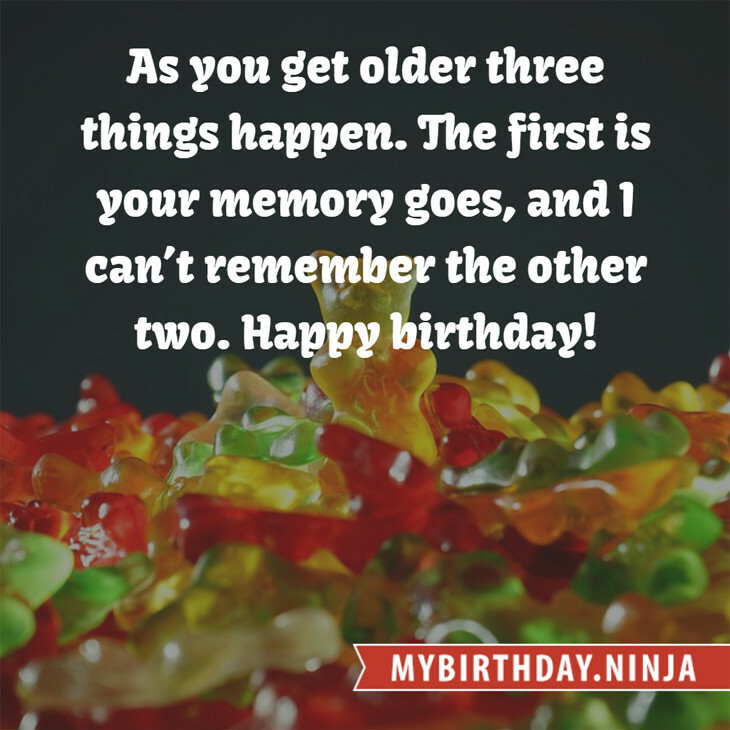 Your birthday numbers 4, 3, and 1930 reveal that your Life Path number is 11. It is a master number that represents intuition, idealism and invention. You have the potential to be a source of inspiration and illumination for people. The following celebrities also have the same life path number: Dita Von Teese, Charnele Brown, Domhnall Gleeson, Bill Maynard, Brainpower, Kristin Davis, Grand L. Bush, Tex Beneke, Jack Antonoff, Davy Carton. What is the birthday horoscope for Apr 3, 1930? The Western zodiac or sun sign of a person born on April 3 is Aries ♈ (The Ram) – a cardinal sign with Fire as Western element. The ruling planet is Mars – the planet of war and ambition. According to the ancient art of Chinese astrology (or Eastern zodiac), Horse is the mythical animal and Metal is the Eastern element of a person born on April 3, 1930. Fun fact: The birth flower for 3rd April 1930 is Sweet Pea for love. What is the Love Match for Apr 3, 1930? When it comes to love and relationship, you are most compatible with a person born on August 9, 1947. You have a Love Match compatibility score of +192. Imagine being in love with your soul mate. On the negative side, you are most incompatible with a person born on January 4, 1931. Your incompatibility score is -221. You’ll be like a cat and a dog on a love-hate relationship. Arf-arf, I want to bite you. Meow-meow, stay away from me! I do not know how you feel about this, but you were a female ♀ in your last earthly incarnation. You were born somewhere around the territory of Central England approximately on 1575. Your profession was sailor, shoemaker. What is the popular baby name on 3 Apr 1930? Here’s a quick list of all the fun birthday facts about April 3, 1930. Celebrities, famous birthdays, historical events, and past life were excluded. Try another birth date of someone you know or try the birthday of these celebrities: March 24, 1990 – Keisha Castle-Hughes, Australian-New Zealand actress; October 19, 1957 – Karl Wallinger, Welsh singer-songwriter, keyboard player, and producer (World Party and The Waterboys); June 29, 1939 – Lo Lieh, Hong Kong martial artist, actor, and director (d. 2002).